I have read several books that attempt to give you insight into the mind of an Imagineer. But honestly many of those books gloss over the skills of theme park design and creativity without giving the reader the tools to use those skills in their professional and non-work life. You often think to yourself, yes I want to be creative, but how do I go beyond the nugget that has been presented to skills building. C. McNair Wilson bucks in trend in Hatch!, a book that provides a formula for successful brainstorming and a blueprint on making this formula work! Hatch! 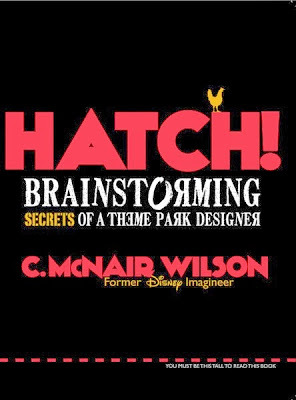 : Brainstorming Secrets of a Theme Park Designer by C. McNair Wilson showcases Mr. Wilson's expertise in brainstorming that has proven to be successful during his time as an Imagineer, private consultant (including for Disney), and within numerous stage productions. The book is broken into two halves. In the first portion, Wilson presents his "7 Agreements of Brainstorming", the principles that he shares with groups when he leads a brainstorming endeavor. The second half focuses on the nuts and bolts of brainstorming from creating your own sand box to brainstorm within, setting up brainstorming teams and the ever terrifying doodling! The author has illustrated the volume with doodles of his own, which reinforce his lessons, and inspirational quotes. I feel like C. McNair Wilson has freed me! That may be overstatement, but it is a fun one. I work within a field where I brainstorm solutions to problems all the time. And recently I even gave a professional presentation where I used Marty Sklar's "Mickey's Ten Commandments" to urge my fellow professionals to quit seeing ourselves as bland and dull writers of vanilla passages but instead as creatives who are artists when fulfilling external regulations. I feel like Hatch! has further provided me tools to continue screaming this fact. So for me, when reading through the "7 Agreements of Brainstorming" it was the liberating principles that stuck out to me. For example, "Agreement No. 6: Wild Ideas" with the mental picture of putting doughnuts on the moon really hit home with me, especially after he showed it was possible to find ways to get doughnuts on the moon! It helped show me that in brainstorming it is not just that no idea is a bad idea, but it was the fact that a wild idea may either be a good idea or provide the seed of a great idea. For me, the six first principles that Wilson provides are about creativity and having the freedom to be creative when brainstorming. Though he still provides space for critical thinking. But even in this phase of planning, Wilson's formula provides plenty of space for creative thoughts. The second half of the book is really the nuts and bolts of how to make the "7 Agreements of Brainstorming" work. Throughout the book it becomes clear that Wilson respects doodling as a way to both foster thought and to express ideas. But, I raise my hand and say, what about me who has little to no drawing skills? What can I do? I am happy to say that Wilson addresses this issue. He provides suggestions on tools and how to practice one's doodling skills so one can have confidence in them. Of course he also gives us a healthy reminder that we do not have to be perfect. Honestly, as I read through this book I thought of a recent business situation where I lead a team through the critical thinking stage of brainstorming a problem without the help of Hatch!. At one point I started doodling on our group notes. This included simple doodles like happy and sad faces, and a burning house. The funny thing is it helped us make a consensus decision for a recommendation, and when we presented it to others we included graphics as part of our presentation! Though someone did have to ask me if one face was crying or just needed a shave! So despite the fact I have no drawing skills at all, I had already seen the power of doodles. (Recently I was faced with a project where I had to draw, an artistic friend gave the great advice of simple geometric shapes. If you are worried about drawing it is a good place to start). Disney fans will be interested in this book since the cover makes note of Wilson's Imagineering past. And the Disney stories within it are enjoyable to the Disney history fan. He recounts the day Michael Eisner asked a team to consider options for the parking lot across from Disneyland. And one of my favorite examples was the evolution of an idea when Wilson suggested they build a hotel in a theme park (thank you, my few days there were very enjoyable). And there are even stories of plans that never fully developed. So overall a Disney fan will be pleased. But one should keep in mind that included stories go well beyond Disney, with stories from his stage productions and even his 40th birthday party. So despite the Disney connection, this really is a book for those interested in creative thinking and effective brainstorming. As I have thought through the book I have found more application to how I support creative thinking at work than adding to knowledge of my Disney fandom. So, one should realize this is a brainstorming book that anyone can use, with some Disney sprinkled in. Hatch! really is a guidebook to creative thinking in group settings, not a history of the creation of Disneyland. When it comes to the question of where to buy Hatch! there are several options. At the author's website you can see all of the purchasing options, including one that helps support some good causes. He has made available a PDF excerpt from the book that you can look through. You can also read some of McNair Wilson's thoughts about Disney and non-Disney things, including his take on Saving Mr. Banks. But being the selfish guy I am, I suggest purchasing the signed personalized copy. My copy has a bit of whimsy to it since the author added his own personal touch. Hatch! 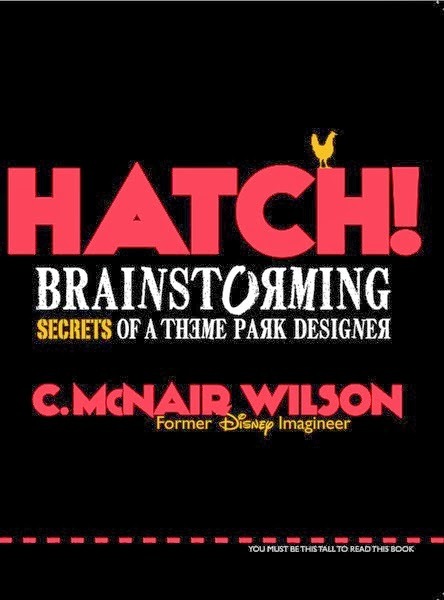 : Brainstorming Secrets of a Theme Park Designer by C. McNair Wilson is a liberating book. It allows the rational being to release themselves into a creative one by providing a simple set of seven agreements. By following these steps one can make a good thing great, much like Imagineering does! But even if you are not a Disney parks fan, you can still gain much by sharpening your brainstorming skills while having some fun. As I sit here at the computer, it is snowing. And I mean it is cats and dogs snowing. So it makes it a perfect time to reflect on the story of Elsa and Anna in Frozen, because it really looks like the landscape outside could have been crafted by Elsa herself. Wide Eyes: What struck me most about the character models in Frozen? Why it was traditional large eyes of course! Disney has a tradition of models with eyes out of proportion to real people and this film follows that tradition. And it works, those eyes are super emotional and help convey the feeling of the story. Ariel would be proud! Fantasyland: Oh Arendelle, can I visit you? Wait maybe I have and your alias is Fantasyland! Arendelle (okay the whole movie) is gorgeous. And I really feel that the castle and the village made me feel like I was in a Fantasyland like setting. Yes, Fantasy Like. It is not a clone of the in park experience but I did feel like if they ever wanted to build a Frozen attraction themed to the movie it could easily fit in. Additionally, the Between Wife and I agreed, a lot of the big landscapes are majestic and would look really good in World of Color. Throw Out the Rulebook: Everyone knows the rules of the princess movie; good behavior and true love. Well, I will say that the behavior of Elsa and Anna are far from proper in every way. As children they actually were, well kids. In fact if anything is really causing Elsa internal struggle it is the need to be perfect in her behavior to avoid showing who she is (in today’s Marvel Universe she would be sent to the Jean Grey School of Higher Learning to learn about her power and controlling it not hiding it). And as adults Anna is silly, and honestly childish. But they still hold true to essentially having a heart for others, even a broken heart, and taking risks for those they care about. My favorite rule changer is True Love. Frozen openly mocks the idea of love at first site. And the eventual act of love needed to be seen on the screen is far from what Snow White, Sleeping Beauty or Cinderella experienced. King Candy: So is Alan Tudyk on studio contract now? Tudyk voices the Duke of Weselton, it is not pronounced the way you think! The Duke is creepy and definitely setup for comedy relief in the story, in the same sort of way that King Candy is in Wreck-It-Ralph. I hope like Ed Wynn, who Tudyk channeled in Wreck-It-Ralph, we continue to see Tudyk in Disney productions. Nick Fury: Marvel Cinematic Universe fans rejoice! Frozen has an end credit scene. Sure, it does not feature Nick Fury moving a franchise big agenda. But it is worth sitting through the credits to see it. And watch the credits carefully in the last minute or so of them running. There is a disclaimer that corrects a controversial generalization that the movie makes! Honestly as Disney has made clear this movie is full of Easter Eggs, from the cast of Tangled to the head cheese himself (maybe). 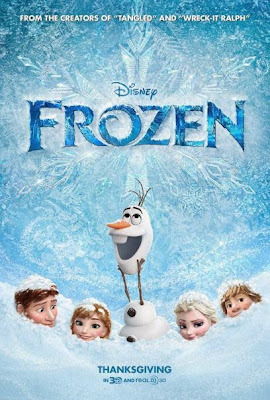 I really liked Frozen and I look forward to seeing it again. I honestly still liked Tangled a little better, but this film was still a hit with me. The fact that I liked it so much surprised me since I was not thrilled with the trailers at all, mostly because they first trailer really did not show me what the movie was really about. And it is a hit with the Between Kids. The oldest is pleased that we now have the Frozen Disney Infinity set, with Anna as the go to character. And the youngest has been running around telling us about the joy of warm hugs. Yep, it is cold out here in Betweenland. The best way to deal with the chill is to get in the spirit and take in a showing of Frozen. Over the last few years, Rolly Crump has allowed Disney fans to look at him as an open book. First, he collaborated on an excellent memoir of his life working for Walt Disney and the years beyond in the themed entertainment business. Then he released a CD of oral history that includes some of his "cute stories". 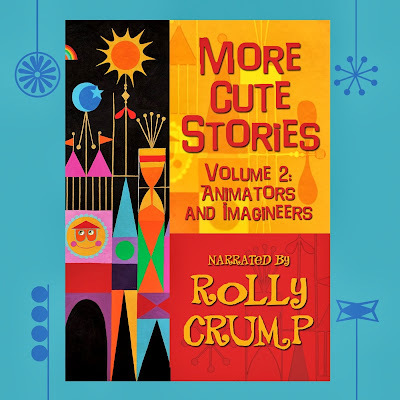 Now with his second volume of audio stories, Crump introduces us to familiar and not so familiar names and provides some frank cute stories of working for WED Enterprises and the Walt Disney Studio as an animator. The format of this collection, More Cute Stores, Volume 2: Animators and Imagineers, is pretty simple. There is a brief introduction where the name of the discussed animator or imagineer is spoken. Then Crump captures a story or two about the Disney contributor in his own words. The stories vary in length from around two minutes to four minutes, one track is less than a minute. The figures covered include a who's who of familiar Disney names including Yale Gracey, Harriet Burns, Bill Justice, Ward Kimball and Blaine Gibson. But there is among the Disney giants names like Art Stevens, Bob Smith and Jack Miller who Disney fans are likely not as familiar with. If I could describe the tone, it would be frank and honest. Crump makes mention of teaching and learning to smoke cigarettes. And since he preferred special food to go with his smokes and had a dealer to help supply his stash, well I'm guessing it was not tobacco that he was rolling. And he calls it as he saw it, including mentioning a time where Marc Davis in his mind committed a shameful act. If anything stands out it is the absence of Alice and Marc Davis with whom he collaborated on it's a small world with. But then perhaps that says something about Crump's feelings (or it could mean nothing at all). Ward Kimball does stand out as someone that Crump respected and appreciated for bringing him to Imagineering. Another thing that stands out is the working conditions at Disney in animation, and it makes sense as you hear Crump talk why animators were at times laid off. I am a big podcast consumer, so I often compare pay audio content to free podcasts. I have not heard Crump tell the majority of these stories elsewhere. Most podcasts want to hear about Yale Gracey, not Keith Elder! If I had not received a review copy, I would have likely bought myself a physical copy for this nearly an hour of stories. But for those who do not wish to pay the full price, there is a download option available for half the price. Honestly, it is fresh and more frank than one would typically find in a podcast interview. More Cute Stores, Volume 2: Animators and Imagineers continues to build the Crump legend. You hear the tales from Crump himself, the man many likely wish they had for a grandfather as he shares credit for many of the Disney successes. And the frankness provides a honesty that makes you understand how he may have grated against others at WED for being such an individual while endearing himself to others. As we have heard it said many times, "It all started with a mouse!" And Jim Korkis in his newest book looks to tell the history of Mickey Mouse, set some myths straight and provide reference material about the world's most famous mouse. Korkis in The Book of Mouse: A Celebration of Walt Disney's Mickey Mouse collects 300 pages of history and reference materials related to Disney's most famous animated creation. The book is written in an essay format. The first section captures stories of Mickey Mouse's birth and early years. This is followed by looks into Mickey Mouse's big screen history including a annotated filmography. Korkis follows this with a discussion of Mickey Mouse in the parks. And he closes with a some words about the relationship between Mickey Mouse and Walt Disney. The book reads to me like a collection of essays and supportive materials. This makes sense, as Korkis has published a number of blog and magazine articles over the years on pretty much everything Disney. In fact, I would guess that some of these essays began as essays published in other locations. So I would say, anyone who enjoys Korkis' writing is going to enjoy this offering since his tone and presentation is consistent with his overall body of writings. The fact that this is a book of essays also means some articles are short and others are longer due to the amount of information that has been uncovered on the topic. And though the essays are collected under the same theme they do not always flow with transitions from chapter to chapter, and some essays repeat information, though not an overwhelming amount. The lack of transition and repeated information for some readers will be an advantage, since the book can be used for just in time information where you do not have to read the chapters before to get an understanding of the topic you want to explore. Korkis does a good job of uncovering myths and providing new information. For example I did not realize that Plane Crazy, Mickey's first produced short, featured another innovation with camera movement in animation. Additionally Korkis shatters the myth that Steamboat Willie was the first synchronized sound cartoon! And the book made it abundantly clear to me that Mickey Mouse is not a character, but is in fact an actor. And as an actor, Mickey can be flexible and be dropped into a number of situations just like any other actor. I wonder if Mickey should take over as Iron Man! Other new information that I really enjoyed was the chapter on Paul Castle, who helped Mickey Mouse for several decades. The chapter is fantastic and for me brought a lot of new information about the behind the scenes preparation to bring Mickey Mouse onto stage. The reference materials are also somewhat useful. While I do not enjoy the chapters consisting of miscellaneous quotes and facts on Mickey, other reference materials were a huge success for me. I have already made notes from the Annotated Filmography for future posts. And looking through it shows the impact that World War II had on the studio and the production of Mickey Mouse cartoons in a visual way. 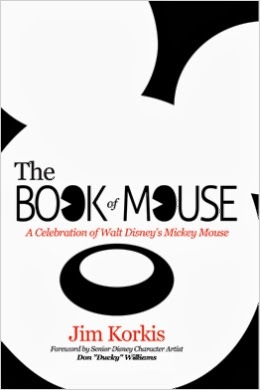 Jim Korkis' The Book of Mouse helps illuminate and expand Disney fans' understanding of Mickey Mouse and his history and relationship with Walt Disney. Fans of Jim Korkis are sure to enjoy this Mickey Mouse offering. And every reader will surely have a better understanding of Mickey Mouse and his importance in Disney history. Honestly Detective Charlie Walker may be having the worst Walt Disney World vacation ever! Sure his entire family loves the resort, but when your family is kidnapped from the Magic Kingdom Park as they sit right next to you, well it is sure to kick off a bummer of a trip! Will Charlie be able to save his family and his love of Disney Parks? Hollow World by Nick Pobursky offers the fictional story of Detroit Detective Charlie Walker. Walker is an intelligent and hard-working officer who made a local splash a few years earlier when he caught a local serial killer. Walker who has Sherlock Holmes like deduction skills does have one retreat from the stress of his detective work, regularly visiting the Walt Disney World Resort with his wife and two daughters. While on his latest trip things go painfully wrong as Walker's family is kidnapped within the confines of Tomorrowland! The kidnapper is a genius, organized mad man who has established an elaborate challenge for Charlie, with the prize being his own family. Charlie must defeat the villain's puzzle set up within Walt Disney World. And the consequences of failure may be beyond the lives of Charlie's family. I usually do not read this type of book, mystery thriller. So I was a little wary that this book would fall flat with me. However, Pobursky provided two hooks that pulled me into the story. First, and most obvious, is the setting of the Walt Disney World Resort which drew me in as a Disney Parks fan. Second, though I am not a first-class detective, Charlie is a family man who loves Walt Disney World. So I can relate to him. And his problem of saving his family is one that does provide plenty of tension for me. Though I will admit compared to Charlie I would be completely useless. So knowing that I would be lost in this scenario and completely overwhelmed, the story effectively had weight for me. Luckily for the story, Charlie Walker is a smarter man than I (or at least more logical). Along with Charlie there are a number of interesting characters that help the story move along. The villain, Spencer Holloway, is precise, intelligent, creepy and immoral. The lives of others mean nothing to him and you really believe he will kill the entire Walker family from the youngest daughter to Charlie himself. Henchman Jeremy is a complicated story of compliance and naughtiness. And Team X-Ray whose interference in the Walker's life changes Holloway's game, is full of interesting characters who I can see carrying a story of their own. So again, despite not typically reading this type of book, I found it very interesting and enjoyable. Pobursky succeeds at bringing realism to the story. For Disney fans stuck in their hotel rooms, Stacy makes the story. And of course that simple fact provides authenticity to the story since you can see the television loop in your head. And for the action, I spent a good thirty minutes Googling the very real Microtech knives. And the security situation at the gates of Disney's Hollywood Studio will ring true and a little scary. The book jacket states that the book is R-Rated Fiction, and I can see how this statement could scare away some readers. But again, I would say do not let this pull you away from the story. The R-Rated situations are similar to those found in thrillers and action-adventures. And they strike realistic to the story. And unlike other Disney based fiction stories, Pobursky does not provide a fictitious history of the parks to support his stories. Instead the resort serves as a real place with a real history in which the story is occurring. So, do I recommend this book? Yes, this is such a no-brainer for me. I read the print book and believe it is a great vacation read. It was bigger than a paperback novel, but still fit nicely in my book bag. I read it over my Thanksgiving break, which could explain why I pictured Holloway as the Duke of Weselton from Frozen. I had received a review copy, but if I had not I would have instantly purchased the Kindle version for myself, because its only $3.99. I so often see books that publishers offer in both a print and electronic format where the electronic format is only a few dollars less than the print edition. But here Bamboo Forest Publishing proves yet again they are concerned with getting their author's work into the hands of the Disney fan instead of gouging pocketbooks. Seriously at that price, even if you are just meh on this read, you have lost virtually nothing. 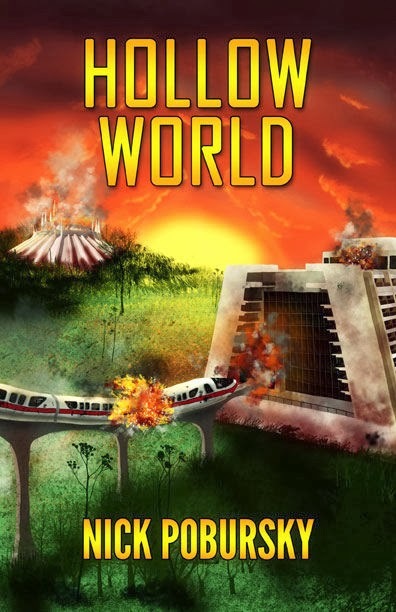 Hollow World by Nick Pobursky is an action story that draws the reader into the story set within Walt Disney World. The reader is tense as one wonders if Walker or his family survives, since it is clear that not everyone will make it through Pobursky's tale unharmed. Hollow World is a fun read that will likely appeal to action-adventure fans (even those with limited knowledge of the Walt Disney World Resort) and Disney fans alike. Honestly, I would really enjoy a sequel involving these characters, even if it was set outside my favorite parks. I wonder if the Walker's have never gone to Universal, I mean I have not but maybe the Walkers could! 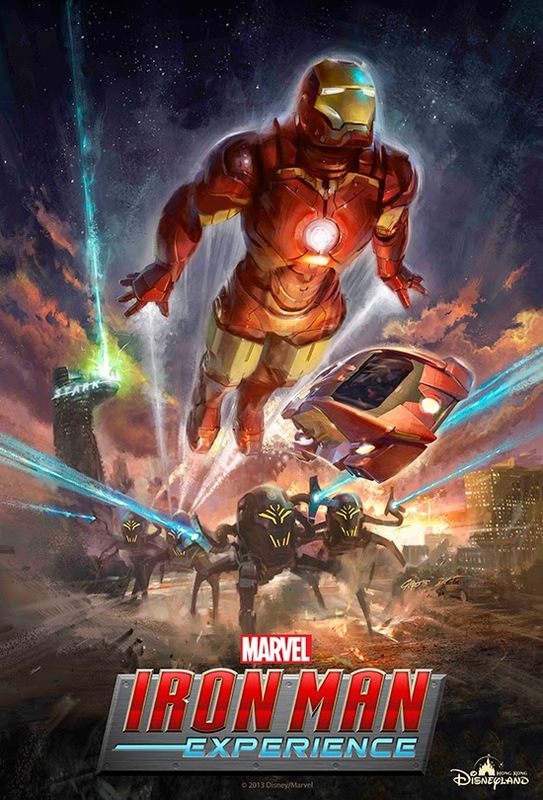 Post-Credit Scene: As a fan of the Marvel Cinematic Universe (MCU) I am always looking for Easter Eggs and Post-Credit scenes. I chuckled as Pobursky gives his reader a post-credit scene, okay its "Acknowledgement", that tips a figurative hat to the MCU. And you have to read the "About the Author" section which has a trademarked chuckle or two, and a promise familiar to James Bond and MCU fans. The Hidden Magic of Walt Disney World continues to be a sentimental favorite for me. It is as I have said before the first Disney book that my wife gave me as a gift. And the Between Book installment reviewing that first book continues to be the most viewed post at BetweenDisney.com! So any book that Susan Veness offers, is something that I must read. The Hidden Magic of Walt Disney World Trivia is a tour of the four parks of the Walt Disney World Resort. But along with a tour, it is a game. For each attraction there are two trivia questions. One question is multiple choice. The second is an open ended question. The answers for both questions are found in the back of the book. Along with the trivia questions, Veness provides a scavenger hunt for each park. And as bonuses a kids and a die-hard scavenger hunt is provided towards the end of the book. And since this is a hidden history book, Veness provides a fascinating fact and something to look for each attraction along with the questions. As a game, the book is lightweight and could fit in most backpacks. The book would probably experience some wear in a pack, but should not add much weight to carry around the park. The questions could easily help fill time in lines within the parks. I have not even considered the eBook version of the book, which would not take up any weight since many guests would have a phone with a book app. I just wonder how quickly one can jump from question to answer. If anyone reads the book on a eReader, I would love the answer to that question. And for added usability, the scavenger hunts can be cut out to go into a pocket our pouch. Most of all I was worried that they would be too easy. They are not, there are plenty of questions that I did not know the answers for. During the week I read this book I kept it on my desk at work. I told everyone who needed something that they needed to start with a question that I could answer, to put me in a good mood. Not everyone started on a good footing! So the questions are definitely challenging and not the same reused facts that we typically find in a Between Book. There is also plenty of new facts that I at least have not run across. For example I did not know the secret of the floating bubbles at Voyage of the Little Mermaid. The quality of facts is beyond what one can generally think to Google. And as someone who has read many books with fun facts, I was satisfied that many of the facts were fresh to me. The book is updated and in fact looks into the future. For example, Veness discusses the very recent addition of mermaids to Pirates of the Caribbean. And of course, the recent Fantasyland additions are all mentioned. But she also has facts for an attraction that is not open with the Seven Dwarfs Mine Train. The only announced addition she does not provide content for is Avatarland, but who can blame her! 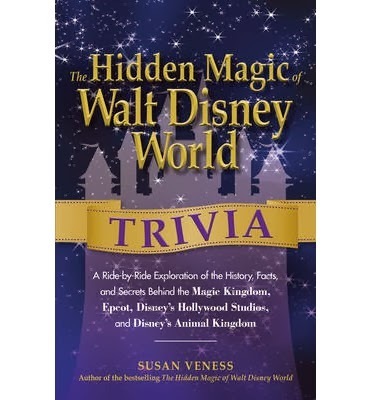 The Hidden Magic of Walt Disney World Trivia is a great extension of the Hidden Magic series. It provides Hidden Magic in a new format, with the trivia providing a twist. The book is interactive by providing a game that the whole family (or office) can play. And the book does not just restate facts that can be found elsewhere (unlike many books I have been reading lately). Fans of Veness' prior works will be pleased and families looking to add bonus fun to their trips should consider this book as a fun option. What did you think. We see plently of stars, I do admit I enjoy Ty Burrell and Tina Fey in most of their performances. And even in this two minutes watching Burrell face off with Sam the Eagle made me snicker. Did I see Loki, why yes I did! But sadly, I do not feel as excited as I was two years ago when the Muppets were huge. So I am hopeful for another great movie. 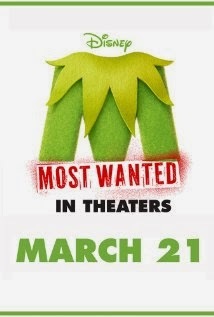 But I am also scared it may be difficult to capture what the Muppets had in 2011 with their return to the big screen. The first thing to remember is that Walt Disney: 84 Fascinating Facts for Kids about Walt Disney is a kids book. So though many Between Books readers may read the book with a historical focus, it is important to remember who the audience is. And with that in mind, despite some issues, it may help young readers know more about Walt Disney and his life. 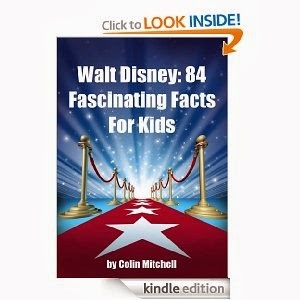 Walt Disney: 84 Fascinating Facts for Kids about Walt Disney by Colin Mitchell is exactly as advertised. There are 84 facts organized by theme in short sentences. The facts are numbered and range from the early life of Walt Disney, his animation years, the building of his theme park and death. They are all short and vary by the amount of detail provided. Let us start with what I did not like. First, like many Kindle books (I downloaded this book for free) the margins at times are off. Some lines are indented deeper than others. Second, some of the facts caught my attention and I wanted more. For example, why did Ub Iwerks leave Disney employment? Yes I know, but a child might also like to know Iwerks' next steps. Third, there are additional editing concerns like not putting film titles in italics, putting them in quotes like they were shorts. Fourth, there is a lack of balance in the facts. For example the animation strike receives eight facts for an event that was relatively short but Disneyland only gets six. And finally there are factual inaccuracies. For example Mitchell states that Walt Disney had hired Lillian Bounds (the future Mrs. Disney) to ink his sketches. Actually, Bounds was working on animated films and never sketched anything specifically drawn by Walt. And the entire chapter titled Kansas provides facts about Walt Disney in Kansas City. The Kansas City metro straddles both Missouri and Kansas with Disney having lived on the Missouri side of the metropolitan area. Despite me finding fault in Walt Disney: 84 Fascinating Facts for Kids About Walt Disney, I do think that the book could make a child more interested in Walt Disney the man. I do wish that the factual errors were corrected, so I do not know if I would pay for this title. But for free, it could make one curious. 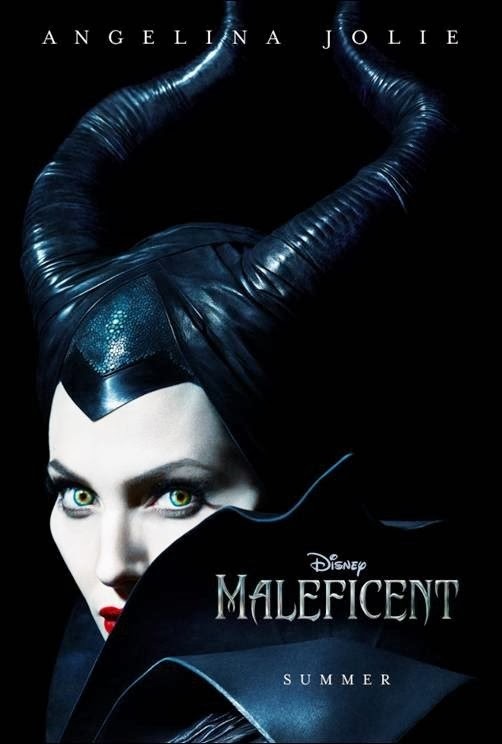 The teaser trailer for the much anticipated Maleficent has been released. Have a quick look at this May 2014 release. I do some some crossover with the classic Sleeping Beauty. But my only other impression at the moment is dark. From a production side, Don Hahn returns to fiction for Disney. I think that is a plus in this feature's favor. And writer Paul Dini I know from comic book and superhero animation, and I know the man can write a good story. But overall at the moment, I just do not have a full sense of what to expect. Well, expect other than dark. Between Books - Walt Disney: The Creation of Walt Disney Co.
Usually when you match free with Walt Disney you catch my attention. 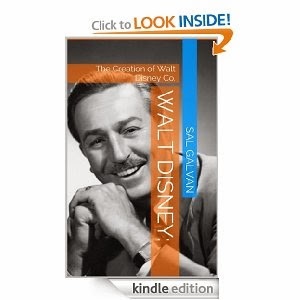 So when I saw Walt Disney: The Creation of Walt Disney Co. by Sal Galvan as free on a Kindle site I follow, well I grabbed it. What I hoped for was an interesting and likely brief discussion on Walt Disney. But what I got was something very different. Walt Disney: The Creation of Walt Disney Co. starts with a very brief discussion of the life of Walt Disney and the establishment of his studio. This is followed by a more lengthy discussion on state of the company today. Special focus is given to Marvel and Lucasfilm and fan reactions to the Disney acquisition of these media companies. Okay, I do not want to sound harsh. There is an interesting premise here, it is just not one about Walt Disney the man. It is mostly observations to the company today as seen through the eyes of Marvel and Lucasfilm fans. And there is plenty of merit to covering that topic. I just wish it was not in a paper under a cover with Walt Disney on it. Walt had nothing to do with those two companies and their purchase. So I really wish this book was retitled. This really is a paper. The fact that the second page states "Research Paper" and "History of Broadcasting" makes me think it was written for a class. I have read enough research papers and journal articles to understand that small in length does not mean nothing to say. But some readers may have issues with purchasing through Amazon someone's homework. I think for me the real issues are in the errors and sources. For the life of Walt Disney no major biographies are referenced, though Wikipedia is! The section on Walt's life makes it feel like the Disney Brothers Cartoon Studio opened with Mortimer, soon to be Mickey Mouse, as their first character. And even today's facts are jumbled with Lucasfilm referred as Lucas Film and Bob Iger as Roger Iger. I can understand these mistakes in a mid-term paper, but better editing and fact checking should have been applied when reaching to a deeper audience. And honestly, it should be retitled. In the end Walt Disney: The Creation of Walt Disney Co. fell flat for me. But much of this was based on expectations! And I would look elsewhere for information about the life of Walt Disney. 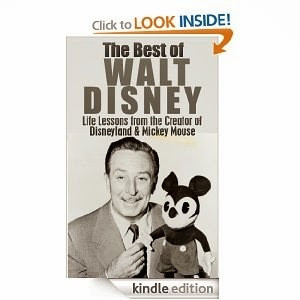 The Best of Walt Disney: Life Lessons from the Creator of Disneyland & Mickey Mouse by Timothy Bauer distills the life of Walt Disney into lessons that anyone can apply in their real life. The book starts with a very brief biography of Walt Disney. This is followed by a history of the company he created. The histories are followed by a timeline and a discussion of the current Walt Disney Company''s units like Disney Parks and LucasFilm. This is followed by discussions on success and life based on Walt Disney's life. I got this a a free Kindle book, and it is only estimated to be around 23 pages long. When you look at the history presented in the text, it is easy to see there a lot of things that will be left out. For example, in the biography on Disney the fact that he started a company is just assumed and left out. And there are gaps. For example the discussion of Disney units mentions Disneyland, but no other parks such as Walt Disney World. And the timeline has as much to do with the Walt Disney Company then it does Walt Disney, for example Michael Eisner is mentioned on the timeline. At a certain point the lessons become as much about the company than the man. Additionally, the lessons could be made stronger to me. I really wish that instead of telling Walt Disney was courageous, that it would be shown to me through a historical example. Currently this book is listed on Amazon at $2.99. I really is a steep price for this book. As a free book it helps me to think about Walt Disney. But as a paid offering it is short and not deep in content. I would pass on The Best of Walt Disney until it comes along for free again. The Carolwood Foundation has done a fantastic job of preserving Walt Disney artifacts. In fact visiting Walt's Barn in in my bucket list. They are now in progress in restoring the "French Village" part of the original Storybook Village. And in return for donations you can pick up some interesting incentives, like an orginal DesignerLand t-shirt. 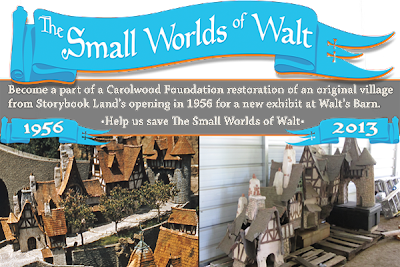 You can find information about donating online and more information about the project including restoration updates at The Small World's of Walt. I have to make a confession. My DVR is currently full of Once Upon a Time. I want to watch it, I really do. I do enjoy it! But I have just not had the time to watch this Disney filled show. 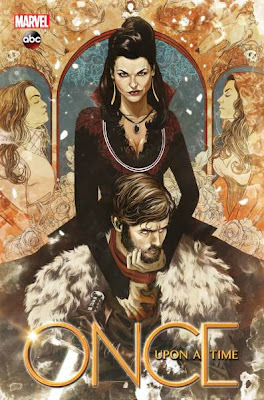 Ironically, I may not have had time to keep up with the show, but I grabbed a copy of Once Upon a Time: The Shadow of the Queen and devoured it as soon as it hit my hands. This story is fully set in the fairy tale world before the creation of Storybrooke and after the Queen took the Huntsman's heart. The story starts with the Huntsman attempting to gather tribute from a silver mining time which has been hit hard in recent years. The tribute of the last bits of silver they own will likely mean they will not survive the winter. The Huntsman with no heart tries to take the tribute without violence. But his efforts are thwarted. The Huntsman discovers that the silver is being used by the Evil Queen as payment to the werewolves if they track down Snow White. We discover that the Huntsman has a prior relationship with the werewolves, that is complicated. In the search for Snow White, the Huntsman reclaims his heart, meets Red Riding Hood, and has to make a sacrifice to set things right. Really what I enjoyed the most about this book was getting to know more about the Huntsman. His character was so quickly on and off the screen we never had a chance to get to know him. And that short time on screen has created mystery around him. Once Upon a Time: Shadow of the Queen really succeeds in making the reader admire the Huntsman in all of his struggles. And despite not having a heart, the Huntsman seems to stay on a moral high ground during all of his adventures. The only thing that I did not enjoy was the hint that the wolves the Huntsman had sacrificed to protect were werewolves. And his relationship with the werewolves has eroded after he ended the Queen's service. I would really prefer that they had not changed the wolves he lived with from regular wolves. Once Upon a Time: Shadow of the Queen is a great graphic novel adventure sent in the Once universe. It builds on a good foundation to make the Huntsman a complicated hero. With this story published by Marvel Comics, it is proof Disney synergy is alive and well. And with a story based on ideas by Eddy Kitsis and Adam Horowitz, it is likely to please the biggest Once fan. 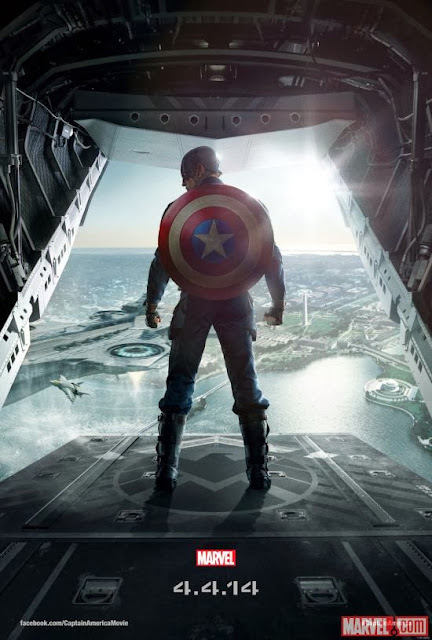 Captain America: Winter Soldier's first trailer has released, and it's a must watch! How awesome is that? Yeah pretty sweet. This is a S.H.I.E.L.D. focused flick, and in many ways could be the big screen version of Marvel's Agents of S.H.I.E.L.D.. This is a spy thriller and I love it. A helicarrier goes down, but I feel like I have seen that shot in other movies. At least in this trailer, Chris Evans is delivering. I feel like the spy world presented here is full of grey hats, and only Cap is working as the white knight. I feel like he could be opposed by both Fury and Pierce (Robert Redford). Based on this thriller my expecations are now huge! I cannot wait until spring! The Art of Iron Man 2 by John Barber and book design by Maz takes the reader behind the scenes of the 2010's Iron Man 2. The book is fairly straight forward with chapters on the Iron Man armor, villains, settings, backgrounds and more. The book is image rich with every page featuring images, concept designs and even story boards. The text focuses on what was behind the choices that designers and film makers made in building Iron Man's world. Really the star of the text is the photos. The captions and text are likely not going to dig deep enough for fans who really want to tear apart of the movie. 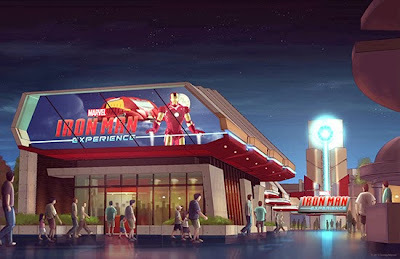 For example, I would of really loved more analysis of how Walt Disney had helped inspire the Stark Expo, Disney receives one mention. 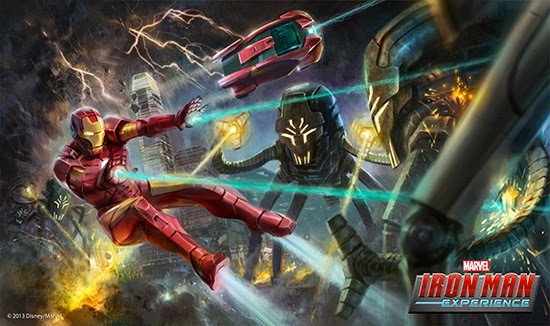 But the pictures are really fun and really help you see the evolution of Iron Man on the big screen. For me one of the most enjoyable features was the close ups of the feebles, the armors made around the globe to attempt to keep up with Tony Stark's technology. The Art of Iron Man 2 is great for fans who want to look at awesome armor designs and to understand what the filmmakers were wanting. However, it may not be deep enough for those who want to drink deeply from the Iron Man mythos. When Disney bough LucasFilm there was a lot of speculation that Star Wars: The Clone Wars would be moved to Disney XD. But hope for Star Wars fans is not lost. 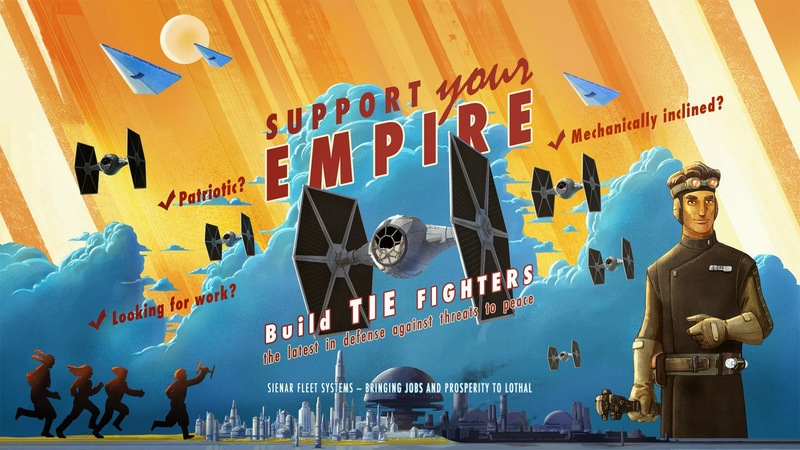 Disney has announced that in 2014 a new animated Star Wars show will make it to Disney XD, Star Wars Rebels. This new show will be set closer to the Original Trilogy, and closer to the characters that will be used in Episode VII. And it will play on a period of Star Wars history that more older fans will be familiar with. And you never know, maybe even Darth Vader could show up. Dave Filoni, in this video from New York Comic Con, talks about what is happening behind the scenes (lots of Star Wars: The Clone Wars staff are still in Disney employ) and outlines the new villain. 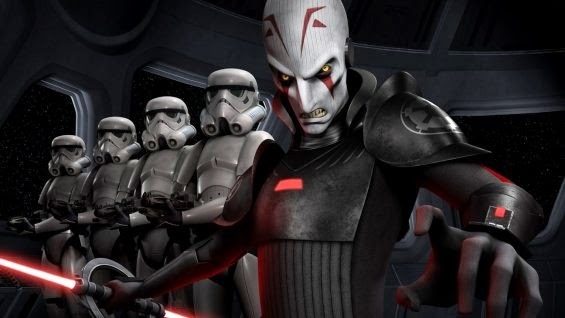 I think it is The Inquisitor that will catch most fans attention, a new Star Wars villain is a pretty big deal (especially for toys)! I will say he does seem close to the Darth Maul model, with his double bladed lightsaber. And it does some interesting that someone who is not a Sith or a Jedi (we think) will be wandering around with this weapon. I am sure that there will be plenty more news in the next year. Until then you may want to keep an eye out at http://www.sienarfleetsystems.com/. 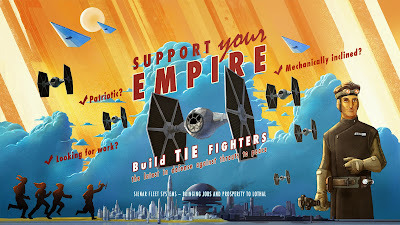 The Empire does need quality Tie Fighters! I will admit, with all my reading on the Eisner Era, one of the personalities that I have become very interested in is Roy E. Disney. So, seeing that a book about the younger Disney was being released, it was a must own for me. I really looked forward to reading a book that was focused on him instead of just seeing him as a supporting actor. 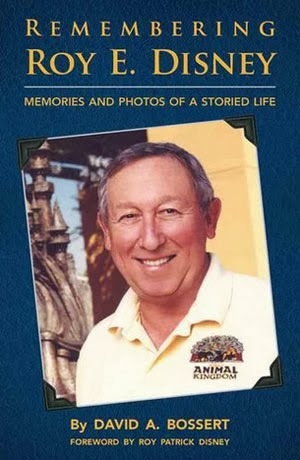 Remembering Roy E. Disney: Memories and Photos of a Storied Life by David A. Bossert is an account of Roy E. Disney written by a close colleague and admirer. Bossert had worked with Disney on several projects and I believe honestly could say they were friends. Bossert travels through Disney's life topically with chapters on sailing, Shamrock Air (Disney's private plane), Destino, and his late life divorce from Patty Disney and marriage to Leslie Disney. The chapters are largely narrated by Bossert but also include personal accounts from figures like Stanley Gold and John Lasseter. The book is also fully packed with personal photos from Disney's life, with nearly every page including an image. I find this book mixed for me. So, lets start with those things I did not enjoy. When you include the forward the bulk of the first 39 pages explain how the book got written. I understand that Bossert wanted to establish his personal view about Roy E. Disney and wanted to tell the story of publication. But for a book that is only around 200 pages this was just too much explanation for me. I wanted to get into the heart of the text, which really does do a good job of showing the relationship between Bossert and Disney. Additionally, for a book that is very picture focused and with a Disney label some of the pictures are fuzzy. The picture of Disney on page 38 is especially fuzzy and I have seen independent publishers do better. It was really not what I expected from a Disney Editions book. The good is really the discussion of Bossert's relationship with Disney. Disney mentored Bossert. So it is an account of one man's relationship with Disney for the majority of the book and not a historical biography. The many stories of Disney's genorcity towards others including Bossert really makes one understand what kind of man Disney was. And since Bossert often worked close with Roy E. Disney, one feels like you are getting an insider's view of Disney. You feel like you were included in Disney's inner circle. Bossert clearly admired Roy E. Disney and based on Bossert's accounts you can understand why. Bossert really paints Disney as a regular down to earth guy who liked Costco hot dogs (one begins to wonder if his father and uncle's culianry choices rubbed off). A storied life is a theme explored in the book. Bossert shows Disney at work and discusses how he contributed to the production of animated features early in the Eisner era. Bossert witnesses and recounts Disney rolling up his sleeves and working arm-in-arm with the story staff, pitching ideas and providing valuable and frank feedback. As I think about the Marty Sklar comments that Disney was never in story meetings, it becomes clear that Disney was at least for a part of his Disney career. A good example is Lilo & Stitch, where Disney's feedback saw a reworking of the story. In the tradition of story, Roy followed his uncle more than his father in this aspect. Remembering Roy E. Disney brings the reader close to the life of Roy E. Disney. Author David A. Bossert worked closely with Disney and grew to admire him in these interactions. As a reader it is hard to not get caught up in the feeling of respect that falls from these pages. Earlier this week Tom Staggs, Chairman Walt Disney Parks and Resorts, announced through the Disney Parks Blog a new addition to Hong Kong Disneyland in 2016. Personally, I am really excited about this new attraction. I think it is fair to say I'm Level Seven excited about this attraction. I just wish it was in one of the domestic parks. But then maybe this will serve as proof of concept for the future removal of Innoventions! But then maybe this attraction would not work in Disneyland or Disney Hollywood Studios. 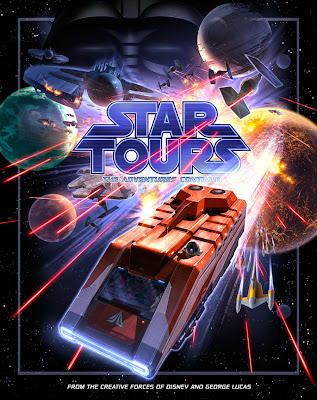 As I look at these graphics I wonder, is that a Star Tours' StarSpeeder? They really do look simliar! So is this a partial walk through with a Hall of Armor concept like was saw at Innoventions last summer combined with a simulator. I cannot see them using the simulator to have guests stroll through the Stark garage! Again, I am excited. I hope this is a huge success. And I wish it was possible for me to visit Hong Kong in 2016. Seriously, Disney, fell free to send me. I'll put some time on my calendar! As I have noted before I have been attempting to find a Star Wars Expanded Universe title to recommend to a friend. Mostly I have struck out. Often some of the best Expanded Universe is either in trilogies or do not feature characters familiar to those fans who have only seen the movies. 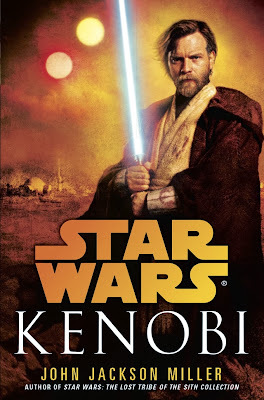 Being someone who first meet Ben Kenobi, or Obi-Wan Kenobi, on Tatooine and having many friends that met this Jedi Knight there I was hopeful the latest novel would be the Expanded Universe book that I could recommend. But then my hopes have been dashed in the past. The first quarter of Star Wars: Obi-Wan by John Jackson Miller focuses on the lives of those hardy folks who live in and around an one-store Tatooine oasis. Orrin Gault is a wealthy moisture farmer who also leads a local posse of farmers and settlers who protect farms against the raids of Tuskens, or Sandpeople. A'Yark is the local Tusken War Leader, whose tribe is slowly dying is hatches a desperate plan to save the Tuskens. A'Yark has a number of secrets and is familiar with the ways of a newcomer in the area, known as Ben Kenobi. Annileen Calwell is a widow and mother who runs her late husband's store, Danner's Claim. Annileen is very interested in the comings and goings of this newcomer who always seems to be around trouble. Those who live in and around the claim live a hard life that is underscored by Tusken attacks and underworld maneuvers. And in the end, nothing is really what it seems to be in this Sci-Fi western. For me this book started really slow. It took me a week to read and the early part of the week was slow going. Part of this was me asking where is Kenobi? His early appearances are few and short as Jackson Miller makes his reader familiar with the new characters he has developed. But by the weekend, the pace had quickened for me and the role of Kenobi, the character I wanted to see, had expanded. By Saturday night I resented the fact that I was tired and could not keep my eyes open any longer to read the climax of the action. When I woke up, the first thing I did was finish. By the end of the book I was sold, and I think the fact I reached for it first thing shows it had me hooked. John Jackson Miller has past experience with Star Wars, but often in a different form. He has written Star Wars comic titles which have been well received. And he even slips in the names of his original Jedi characters. Additionally, he has written short stories which were collected as Star Wars: Lost Tribe of the Sith: The Collected Stories which are highly entertaining snippets. But all of these stories are generally set thousands of years before Star Wars: A New Hope with this being his first attempt at Original Trilogy characters. And I would say that he does an excellent job writing this especially iconic character. I do wonder if in the Disney era if we will see a Star Wars book like this in the near future. Clearly it was written before the Disney purchase. The story looks back and references heavily characters from Star Wars: The Clone Wars and characters that look into the past, not the future and Star Wars: Episode VII. The shadow of Anakin Skywalker leaves a bigger impact on this story than infant Luke Skywalker or his uncle Owen Lars. One might expect a story where Kenobi was interacting with the Lars' family. I think that Disney would have preferred that story, focused on moving readers to their 2015 movies, instead of a series that they cancelled and movies produced before they bought the property. 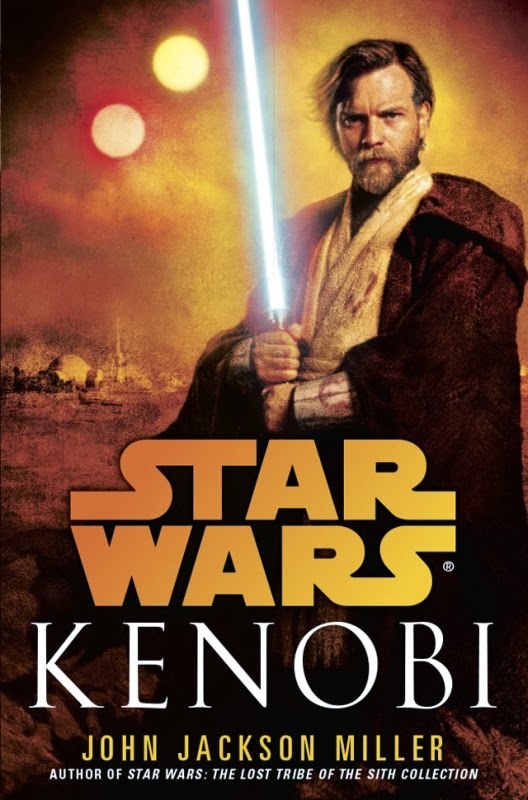 I would recommend Star Wars: Kenobi to the casual Star Wars fan. The book is well written and ends with a flurry of action that wraps the reader up. 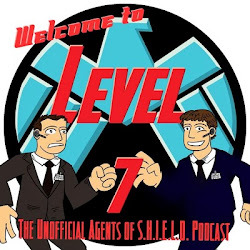 But this comes with the caveat that it has a slow beginning as John Jackson Miller takes the time to introduce us to his all new cast of characters. Jack Duncan is your typical Disney Parks fan. He enjoys spending time with his family at Disneyland. He visits as often as possible, which for him is a lot. He knows to savor the background and setting established by the Imagineers. His mind holds a wealth of Disney history and trivia. And he is a Special Forces trained security expert that is our only hope against a terrorist plot that would wipe Disneyland off the map and kill many in the area. So yeah, typical Disney fan. 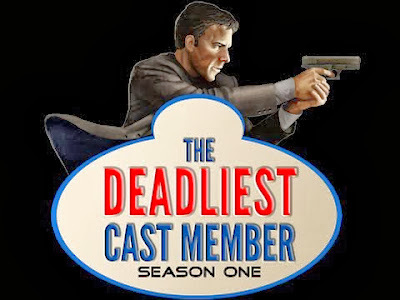 The Deadliest Cast Member: Season One by Kelly Ryan Johns collects the previously released Season One installments of this story that had been released as e-books. Johns introduces us to Jack Duncan, a father, widower and the guardian of Disney’s security. Duncan’s father was a close friend and associate to Walt Disney and had created Disneyland’s elaborate security system. Jack spends most of his year living in a suite at Disney’s Grand California Hotel & Spa. Duncan had left his role as a Navy Seal to follow his father’s footsteps in the parks. Jack is also a celebrity, having completed an unexplained heroic act in the parks a few years ago. Additionally, his wife passed away in an undisclosed fashion due to the actions of his and his father’s nemesis, Nikolai Grusov. Grusov, despite Jack believing he had killed the villain earlier, is back and holds the Disneyland resort hostage with a dirty bomb. Duncan takes the lead in a story that incorporates mystery, action, speculative technology, Disney history, and maybe magic (or is that science by another name). There are a lot of layers to pull back on this story when breaking it down. First, as a Disney fan, this story is a dream come true. Jack and his kids basically live at Disneyland. He has a fantastic suite at the Grand Californian. And when he has to move out of his lodgings, for Johnny Depp who Jack is friends with, he moves temporarily into the Dream Suite! That just does not seem fair! Really who among us would not enjoy this lifestyle! The Duncan’s eat at Club 33 and can exclusively use rooms in the club. He can access back exits and hidden tunnels to get around in the park. He is tied to the history of the park through his father, who was Walt Disney’s “greatest friend”. It really is a dream life. And Johns knows the park, so as you are jealous of Duncan and his lifestyle, the park serves as a character within the book. Second, this is an action story. This is a 24 type anti-terrorism story set in Disneyland. There are guns, bombs, martial arts and fighting. There is a goal of finding and defusing a bomb before an entire community is harmed. And at the center of it all is Jack the experienced and capable military operator. And I feel it worked on this level. In fact, I may never look at the park the same way again. Could a gunman be behind that corner? Third, this story is a mystery or a puzzle. Much like a book with a very different tone, In the Shadow of the Matterhorn, readers are provided a mystery within the park. And the story is built around real locations and fake clues within the park. For Disney fans, this mystery goes back to Walt Disney himself and his hopes for his Park. Finally, The Deadliest Cast Member: Season One is a work of speculative fiction. It is filled with Sci-Fi science, or magic, that we do not use in our world. But they do help to show how fictional magic exists within Disneyland. This element is probably the one I expected the least, and probably needed the least. This final element probably most reminded me of Midlife Mouse, yet another very different book. And despite the fact that there is a lot going on in this story, the book still worked for me with this element mixed in. Cost wise this book sells for $4.99 on Kindle, which seems like a competitive price point. It collects 6 separate segments which sell for 99 cents to $2.99 a piece so you do save in buying the compiled version. At that price I do not believe that you are taking a huge risk in buying the novel. And if you have concerns you can sample for less than a dollar. Overall, I enjoyed The Deadliest Cast Member: Season One by Kelly Ryan Johns. It is an escapist action adventure with a touch of sci-fi that caters to Disney fans. I will admit this is one of the first books I have ever read that has Johnny Depp as a fiction character. But in the end, I found myself joining Johns in his enjoyable story. And I for one would like to see a season two at a later date. What I really wanted to show today was the Avengers: Age of Ultron leaked trailer from San Diego Comic Con. But everytime I go to watch it, Disney legal has gotten it taken down, likely moments before I went to view it. So instead I give you Thor: The Dark World's recent TV promo, which was played during Marvel's Agents of S.H.I.E.L.D. this week. Honestly, I loved this because Jane Foster gets a chance to address relationship stuff, dude why didn't you call! 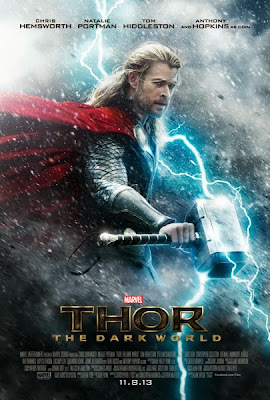 If you have not seen it yet, here is the full trailer for Thor: The Dark World which will be released on November 8, 2013. 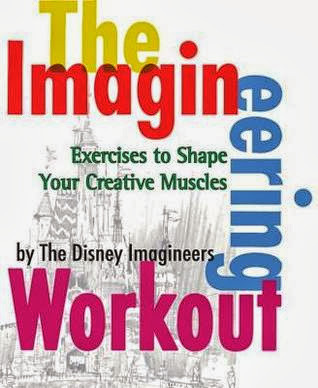 The Imagineering Workout: Exercises to Shape Your Creative Muscles by the Disney Imagineers is a collection of mostly one page essays that highlights different aspects of the creative process. Topics in the book range from using your creative license, considering the audience, storytelling, and finding inspiration. Contributors include Imagineers familiar to Disney fans such as Tony Baxter and Jason Surrell and many more who’s names are not as public. Along with the text many of the essays are illustrated or have boxes for readers to write notes to help sharpen their creative skills. The essays also have grey boxes with areas of emphasis. This volume really is a companion to The Imagineering Way but with shorter essays. The topics and tone of both books are generally the same. The book is one that a reader could pick up and put back down to come back to later with the short essays. And it is a volume that one can search for just what you need when you need it. Honestly, I have been using it to gather quotes over the last few weeks to share at work and for a presentation. But the book itself as straight through read can be difficult as the writers switch from page to page. Overall, for anyone doing a creative task, which is really everyone, this book can provide inspiration but not detailed techniques on creating. The Imagineering Workout is a short volume that provides inspiration from those who build the Disney Parks. It is something that can be a good creativity resource though it really is not a how to but inspiration. For those who want short and small packets of inspiration, this could be a good book to explore.